A 5-tube radio is nothing compared to this 15-tube behemoth. This Detrola made its way into my collection from a VRPS auction for a measly twenty dollars. The radio has two huge Utah speakers, one of which is a field-coil type and the other a permanent magnet type, and fifteen tubes! According to my references, this is the only model made by Detrola with fifteen tubes and has the most tubes of any Detrola model. 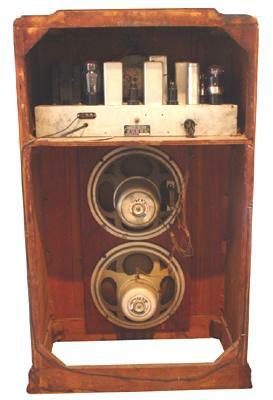 The audio output stage consists of four 42s, two of each in parallel in a push-pull configuration, four 76s were needed for phase inverting and to drive the 42s. 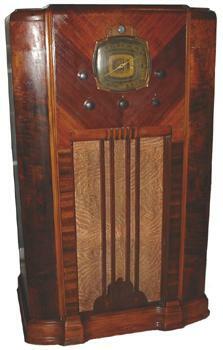 One would expect that such a colossal radio as this should have more bells and whistles like motorized tuning. Interestingly, this Detrola model does not have motorized tuning perhaps because the tubes take up most of the chassis space. The cabinet was stripped and refinished completely and the electronics only needed recapping and some new resistors.